This crown includes wild roses! a tribute to the crown of roses from which this devotion began. The Aves are sweet 7mm faceted rondelles of aventurine; and the Paters capture ethereal white blossoms in beautifully-detailed 14mm handmade lampwork beads made by Kalera Stratton (see detail and link below). The rosary is completed with sterling rose centerpiece, and sterling San Damiano crucifix. with pamphlet describing the provenance and prayers . This crown warbles with a flock of birds! 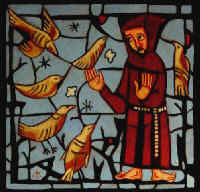 a tribute to St Francis' Sermon to the Birds . The Ave beads are faceted 8mm rounds of flourite. The Pater beads are birds carved of amethyst: doves, owls --- and penguins!. The rosary is completed with pewter figural centerpiece, and San Damiano crucifix. This crown includes wild roses! a tribute to the crown of roses from which this devotion began. Emphasis is given to natural materials: The Aves are sweet 7mm faceted rondelles of moss agate; and the Paters are carved aventurine in magnificent 24mm wild roses. The rosary is completed with pewter figural centerpiece, and San Damiano crucifix. For a similar design, please inquire. Earthy poppy jasper, in 8mm rounds, speaks of the humility of St. Francis. Pewter sun/moon beads remind us of his Canticle to the Creatures, addressing Brother Sun and Sister Moon. The rosary is completed with pewter figural centerpiece, and San Damiano crucifix. The woodland colors of fancy jasper, in 8mm rounds, were the home to the creatures that St. Francis devoted himself to. The rabbits that followed him are represented in carved aventurine. The rosary is completed with pewter figural centerpiece, and San Damiano crucifix. One-of-a-kind! This crown includes a rose! a tribute to the crown of roses from which this devotion began. A beautifully-detailed 1.5" rose carved from picture jasper is accompanied by earthy beads of natural materials: The Aves are 7mm cubes of antiqued bone, wonderful to hold; and the Paters are 16mm rounds of intricately-carved horn in a floral design. The rosary is joined by pewter figural centerpiece with antique gold finish. "Let the brothers and sisters keep the example of the Blessed Virgin Mary, the Mother of God and of Our Lord Jesus Christ, ever before their eyes. Let them do this according to the exhortation of St. Francis who held Holy Mary, Lady and Queen, in highest veneration, since she is the virgin made church. Let them also remember that the immaculate Virgin Mary, whose example they are to follow, called herself the handmaid of the Lord." From the very beginning, Christians continued the Jewish tradition of praying and singing the 150 psalms as part of their sacred routine of daily prayer. By the Middle Ages, however, a largely illiterate population could neither appreciate the historical events to which the psalms referred, nor could they memorize and recite the psalms in Latin. Therefore, in the early 13th century a scriptural meditation was thoughtfully adapted for those who desired to participate in the sanctification of daily life through a cycle of prayer meant to complement the Divine Office chanted by the more educated monks and nuns. What became known as the rosary was the recitation of the Aves and Paters (the Our Father and Hail Mary) that were counted off on a ring of beads numbering 150. The mysteries of the New Testament were meditated upon within this "mirror" of the 150 Old Testament psalms. Hence, Salvation History itslf permeated this simple method of prayer. The repetition allowed for a rhythmic breathing, leading the participant to an inner realm of peace and calm. The rosary eventually became a favoured personal devotion among many people, including the learned laity and religious. The name rosary was derived from the rose, a flower having a great depth of symbolism. One of the spiritual titles given to the Virgin Mary, Mystical Rose, referred to her womb as the developing flower of Christ the Saviour. Moreover, the patient unfolding of the five concentric petals of the rose was likened to our own patient mastery of the five senses, the integration of all the creative and life-communicating energies of a human person. Yet the blossoming of the spiritual life could only be achieved and maintained by the defensive "thorn" of daily perseverance. Through the centuries the Dominican Order has been very influential in the promotion of the rosary as we know it today. Other religious communities also developed and practiced their own particular form of this prayer. The Franciscan rosary, or as it is properly called, The Franciscan Crown, dates to the early part of the 15th century. At that time a young man who found spiritual joy in weaving a crown of wild flowers for a beautiful statue of Mary decided to enter the Franciscan Order. After entering the community, however, he was saddened when he no longer found the time to gather flowers for his personal devotion. 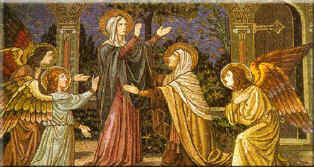 One evening, while feeling tempted to abandon his vocation, he received a vision of the Blessed Virgin Mary. The Virgin Mother encouraged the young novice to persevere by reminding him of the joyfulness of the Franciscan spirit. She also instructed him to meditate daily on seven joyful events from her own life as a new form of the rosary. Instead of a crown of flowers, the novice would now weave a crown of prayers. Before long, many other Franciscans began to pray the Crown and soon it spread to the entire Order, becoming officially established in 1422. In addition to developing this Marian devotion, the Franciscans are credited with adding the final words to the Hail Mary, Holy Mary, Mother of God, pray for us sinners now and at the hour of our death. In 1263, Saint Bonaventure, Minister General of the Order, encouraged liturgical devotion honouring the mystery of the Visitation. Saint Bonaventure also popularized the daily triple recitation of the Angelus which it is believed Saint Francis initiated after visiting the Holy Land. Francis was deeply impressed by the Muslim practice of stopping to pray several times a day, and desired to Christianize this pious custom. A Franciscan pope, Sixtus IV (1471-1485), introduced the feast of the Immaculate Conception and the feast of Saint Joseph as husband of Mary. He also issued the first papal pronouncement encouraging the rosary as in invaluable instrument of personal and societal conversion. 1. The Franciscan Crown consists of seven decades of Hail Mary's, each preceded by an Our Father and followed by a Glory Be. 3. It begins with the sign of the cross which is then followed by seven decades, each consisting of one Our Father, ten Hail Mary's and one Glory Be. 4. At the end of the seven decades, there are two additional Hail Mary's, bringing the total of Hail Mary's to 72 years. 5. The Crown may be concluded by praying one Hail Mary and one Our Father for the intentions of the Pope. A beautifully illustrated Seven Joys of Mary can be found at the site for the National Shrine of St. Francis of Assisi. Most High Almighty Good Lord, Yours are praise, glory, honor and all blessings; To You alone! Most High, do they belong, and no man is worthy of speaking Your Name! Brother Sun, who gives us the day by which You light our way, and who is beautiful, radiant and with his great splendor is a symbol to us of You, O Most High! And be praised, Lord, for our Sister Moon and the Stars. You created them in the heavens bright, precious and beautiful! and the clouds and for fair weather and for all other through which You sustain Your creatures. And be praised, my Lord, for our Brother Fire, through whom You light up the night and who is handsome, joyful, robust, and strong! supports and carries us and produces the diverse fruits and colorful flowers and trees! Praise and bless the Lord and give thanks to Him and serve Him with great humility! who have done Your most holy will; for the second death can cause them no harm! One day a brother brought a rabbit who had been caught in a trap to St. Francis. Francis advised the rabbit to be more alert in the future, then released the rabbit from the trap and set it on the ground to go its way. But the rabbit hopped back up onto Francis’ lap, desiring to be close to the saint. Francis took the rabbit a few steps into the woods and set it down. But it followed Francis back to his seat and hopped on his lap again! Finally Francis asked one of his fellow friars to take the rabbit far into the woods and let it go. That worked. This type of thing happened repeatedly to Francis—which he saw as an opportunity to praise the glory of God. If the simplest creatures could be so endowed with God’s wonder, how much the more so we humans! Fish were also known to obey Francis. Whenever a fish was caught and Francis was nearby, he would return the fish to the water, warning it not to be caught again. On several occasions the fish would linger awhile near the boat, listening to Francis preach, until he gave them permission to leave. Then they would swim off. In every work of art, as St. Francis called all creation, he would praise the artist, our loving Creator. moreover He preserved your seed in the ark of Noah, that your race might not perish out of the world; still more are ye beholden to Him for the element of the air which He hath appointed for you; beyond all this, ye sow not, neither do you reap; and God feedeth you, and giveth you the streams and fountains for your drink; the mountains and valleys for your refuge and the high trees whereon to make your nests; and because ye know not how to spin or sow, God clotheth you, you and your children; wherefore your Creator loveth you much, seeing that He hath bestowed on you so many benefits; and therefore, my little sisters, beware of the sin of ingratitude, and study always to give praises unto God. 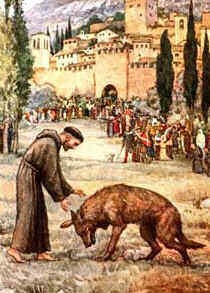 Perhaps the most famous story of St. Francis is when he tamed the wolf that was terrorizing the people of Gubbio. While Francis was staying in that town he learned of a wolf so ravenous that it was not only killing and eating animals, but people, too. The people took up arms and went after it, but those who encountered the wolf were killed. The villagers became afraid to leave the city walls. Francis took pity on the people and the wolf as well and decided to go out and meet the wolf. He was desperately warned by the people, but he insisted that God would take care of him. A brave friar and several peasants accompanied Francis outside the city gate. But soon the peasants became terrified and said they would go no farther. Francis and his companion began to walk on. Suddenly the wolf, jaws wide open, charged out of the woods at the couple. Francis made the Sign of the Cross toward the wolf who immediately slowed down and closed its mouth. Then Francis called out to the wolf: “Come to me, Brother Wolf. I wish you no harm.” At that moment the wolf lowered its head and lay down at St. Francis’ feet, meek as a lamb. The wolf showed its assent by moving its body and nodding its head. Then to the absolute surprise of the gathering crowd, Francis asked the wolf to make a pledge. 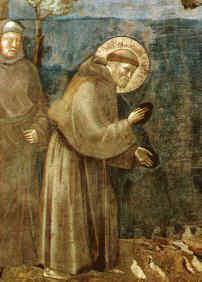 As St. Francis extended his hand to receive the pledge, so the wolf extended its front paw and placed it into the saint’s hand. Then Francis invited the wolf to follow him into town to make a peace pact with the townspeople. The wolf meekly followed St. Francis. By the time they got to the town square, everyone was there to witness the miracle. Then he offered the townspeople peace, on behalf of the wolf. The townspeople promised in a loud voice to feed the wolf. Then Francis asked the wolf if he would live in peace under those terms. He bowed his head and twisted his body in a way that convinced everyone he accepted the pact. Then once again the wolf placed its paw in Francis’ hand as a sign of the pact. From that day on the people kept the pact they had made. The wolf lived for two years among the townspeople, going from door to door for food. It hurt no one and no one hurt it. Even the dogs did not bark at it. When the wolf finally died of old age, the people of Gubbio were sad. The wolf’s peaceful ways had been a living reminder to them of the wonders, patience, virtues and holiness of St. Francis. It had been a living symbol of the power and providence of the living God. HISTORIA: Las "Siete Alegrías", también conocidas como la Corona Franciscana o Rosario Seráfico, es una devoción que recuerda siete episodios felices en la vida de la Santísima Virgen María. La costumbre originó entre los franciscanos a principios del siglo quince en Italia, durante la era de San Bernardino de Siena (1380-1444). Los temas, sin embargo, son más antiguos. Se parecen a los Gaudes del siglo doce, alabanzas en latín que ruegan a María que se alegra porque Dios la ha favorecido de varias maneras. ORACIONES: El devotado reza un "Padre Nuestro" y diez "Ave Marías" por cada uno de las Siete Alegrías. Las oraciones finales son: dos más "Ave Marías", para llegar a un total de 72. El número "72" tiene significado. Rinde honor a la tradición que María vivió en este mundo por 72 años. Manuales devocionarios a veces agregan otras oraciones de inicio o de clausura, pero estas son opcionales. COLLAR DE CUENTAS: Igual que en el caso del Santo Rosario, hay un collar de cuentas para rezar las Siete Alegrías. El collar de la Corona Franciscana es conveniente para contar las oraciones, pero no se requiere para llevar a cabo la devoción. Hay 70 cuentas en un círculo, que está conectado a una medalla, y además un colgante de 2 cuentas que termina con el crucifijo Damiano. El círculo contiene siete decenarios de cuentas que representan las "Ave Marías." Una cuenta de "Padre Nuestro" separa cada decenario -- con una excepción: La cuenta de "Padre Nuestro" para la Primera Alegría se encuentra en la medalla conectador. Para rezar las Siete Alegrías usando el collar de cuentas: Se empieza con la cuenta de "Padre Nuestro" más cerca a la medalla conectador. Se siguen las cuentas hasta regresar a la medalla conectador. De ahí se continúa con el colgante, pero se omite la primera cuenta (ya que se usó para iniciar la devoción). Las cuatro cuentas restantes del colgante se usan para rezar las cuatro oraciones finales. De tal manera uno llega al crucifijo. 1. La Anunciación a la Santísima Virgen. Lectura: Lucas 1: 26-33, 38. 2. La Visitación de Santísima Virgen a Santa Isabel. Lectura: Lucas 1: 39-45. 3. El Nacimiento de Nuestro Señor. Lectura: Lucas 2: 6-12. 4. La Adoración de los Reyes Magos. Lectura: Mateo 2: 1-2, 10-11. 5. El Niño Jesús hallado en el templo. Lectura: Lucas 2: 41-50. 6. La Resurrección de Nuestro Señor. Lectura: Marcos 16: 1-7. 7. La Asunción de la Santísima Virgen al Cielo y su Coronación como Reina del Cielo. Lectura: Lucas 1: 46-55..
Sobre las "Siete Alegrías" y La Corona Franciscana. Copyright ©2002-2003 por E. M. Mulhare. Este texto se usa con permiso de la autora. 7. Coroação da Virgem Imaculada no céu. 1º No primeiro mistério consideramos a alegria de Nossa Senhora ao ouvir do Arcanjo São Gabriel que fora escolhida por Deus para ser Mãe do Salvador. 2º No segundo mistério consideramos a alegria da Santíssima Virgem em casa de sua prima Santa Isabel, quando foi pela primeira vez saudada como Mãe de Deus. 3º No terceiro mistério consideramos o inefável gozo de Nossa Senhora no estábulo de Belém, quando seu Filho divino nasceu milagrosamente. 4º No quarto mistério consideramos a alegria de Nossa Senhora quando os três magos vieram de longe adorar o Menino Jesus e oferecer-lhe ouro, incenso e mirra. 5º No quinto mistério consideramos a alegria de Nossa Senhora quando achou o Divino Menino no Templo entre os doutores. 6º No sexto mistério consideramos a alegria e o júbilo da Santa Mãe de Deus, quando, na manhã de Páscoa, viu seu Filho divino ressuscitado e glorioso. 7º No sétimo mistério consideramos a maior de todas as alegrias de Nossa Senhora, quando morreu santamente e foi levada aos céus, com corpo e alma, acima dos coros angélicos, à direita de seu Filho divino, que a coroou Rainha dos anjos e dos santos. 2º ... que com grande alegria levastes em visita à Isabel. 3º ... que com grande alegria destes à luz em Belém. 4º ... que com grande alegria apresentastes à adoração dos Magos. 5º ... que com grande alegria encontrastes no Templo. 6º ... que com grande alegria vistes ressuscitado e glorioso. 7º ... que vos elevou aos céus, ó Virgem Maria. ( 1 Padre Nostro, 7 Ave Maria e alla fine la giaculatoria: “Siano sempre benedette le gioie di Maria, Madre di Dio e Madre nostra!” ). Alla vittima pasquale, s’innalzi oggi il sacrificio di lode. L’agnello ha redento il suo gregge, l’innocente ha riconciliato noi peccatori al Padre. Morte e Vita si sono affrontate in un prodigioso duello. Il Signore della vita era morto; ma ora, vivo, trionfa. “Raccontaci, Maria: che hai visto sulla via?” . “La tomba del Cristo vivente, la gloria del Cristo risorto, e gli angeli suoi testimoni, il sudario e le sue vesti. Cristo, mia speranza, è risorto; e vi precede in Galilea”. Sì, ne siamo certi: Cristo è davvero risorto. Tu, Re vittorioso, portaci la tua salvezza. (Sequenza pasquale). O Maria, Madre della gioia, sappiamo che tu incessantemente intercedi per noi presso il trono dell’Altissimo: perciò, presentandoti tutte le nostre necessità spirituali e materiali, ti supplichiamo fiduciosi ripetendo insieme: Prega per noi! Padre Santo, ti adoriamo e ti benediciamo per averci donato nella Vergine Maria una madre che ci conosce e ci ama e che sul nostro cammino hai posto quale segno luminoso. Donaci, ti preghiamo, la tua paterna benedizione perchè ci renda capaci di ascoltare col cuore le sue parole, di seguire con docilità la strada che ci ha indicato e di cantare le sue lodi. Accogli, Padre buono, questa nostra preghiera che ti rivolgiamo in comunione con Lei cantando insieme il Padre Nostro .